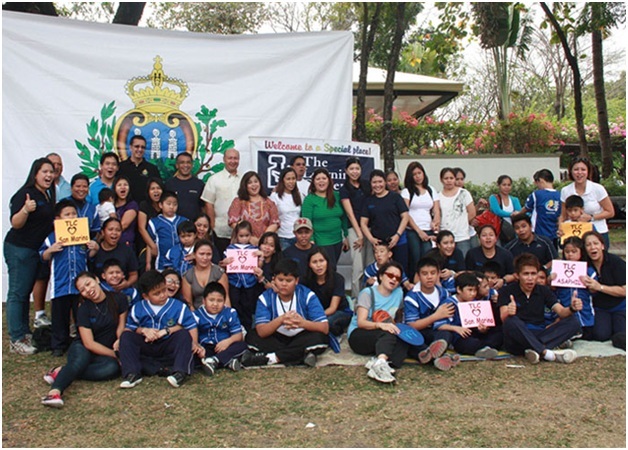 The San Marino Consulate Office in partnership with the Amateur Softball Association of the Philippines organized a four-day sports clinic for kids with special needs of The Learning Center Inc. in Merville Subdivision, Paranaque. Headed by coach-facilitators Nina Buenaventura, Virgilio Cruz, and Nina Serafilo, 19 kids were trained with basic softball drills last January 24 and 31. On the other hand, 24 adults were trained last January 25 and February 1. “This is the first time that this kind of sports clinic was held in the country. We’re glad that this is a success.” said Consul General Jean Henri Lhuillier.” We’re now planning to take this to a higher level, and conduct series of sports clinic for special children nationwide,” added Lhuillier. Softball is a popular sport in San Marino. In line with this, Lhuillier would like to promote this sport in the country since it is not as popular as other sports. Aside from softball, he also supports Philippine tennis and basketball. Also present in the event was Coach Maurice Paraha, an International Softball Federation certified softball coach who is helping the Philippine delegation to prepare for the ISF Men’s World Softball Championship. For more information about The Republic of San Marino, visit http://www.sanmarinophil.com/index.aspx.